I love most almost everything about this space because it gives a place for pretty much every bit of paper that used to land on our counters. the bulletin board towards the top of the wall. most of what would go up there anyway. I found these chalkboards at Hobby Lobby. They were $4.99 a piece and were 30% off of that. So I went ahead about bought six of them. Hubs drilled a hole on each side. He used the first one as a guide to make sure the others were all the same. I decided to use one chalkboard for each day of the week (and one for the weekend). I found a fun font on my computer and printed out the days of the week. I simply taped them on because I’m not sure that they are going to stay that way. You know me, always changing it up. ? I used chalk markers that I found at Michaels. They don’t rub off like chalk unless you get it wet. and doesn’t look quite as cluttered. Wondering what happened to the bulletin board? that has been begging for something to be hung. Not sure what happened to the color in these pics. The wall isn’t really splotchy like this. 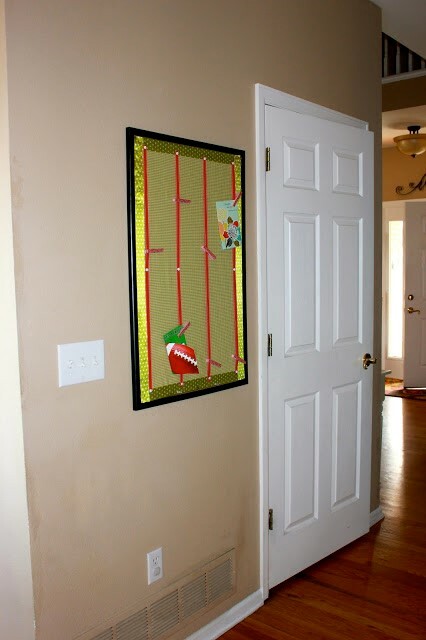 Perfect place to hang those odds and ends: invitations, pictures, etc. That door is open most of the time so I don’t have to worry if it is starting to look cluttered. **Stay tuned tomorrow and I’ll show you how to come up with a cleaning and laundry schedule that works for you as well as some free printables.